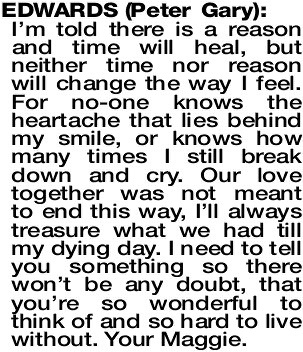 I'm told there is a reason and time will heal, but neither time nor reason will change the way I feel. For no-one knows the heartache that lies behind my smile, or knows how many times I still break down and cry. Our love together was not meant to end this way, I'll always treasure what we had till my dying day. I need to tell you something so there won't be any doubt, that you're so wonderful to think of and so hard to live without. Your Maggie.